• Effectively treats 'Hole in the head disease'. • Effectively treats other bacterial and fungal infections. • Prevents disease in newly acquired stock. 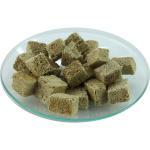 • Protects fish from secondary infections. 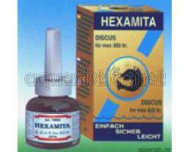 HEXAMITA can also be used in conjunction with EXIT Anti-Whitespot Treatment to solve and prevent most diseases your Discus and Cichilds will encounter. Treats 800 litres / 210 US gallons / 175 UK gallons. Very good product, totally satisfied.